For most people, making the decision to go solar brings up many questions. Even just thinking about switching to solar energy can sound strenuous. However, many people don’t know how easy and simple the solar process can be! 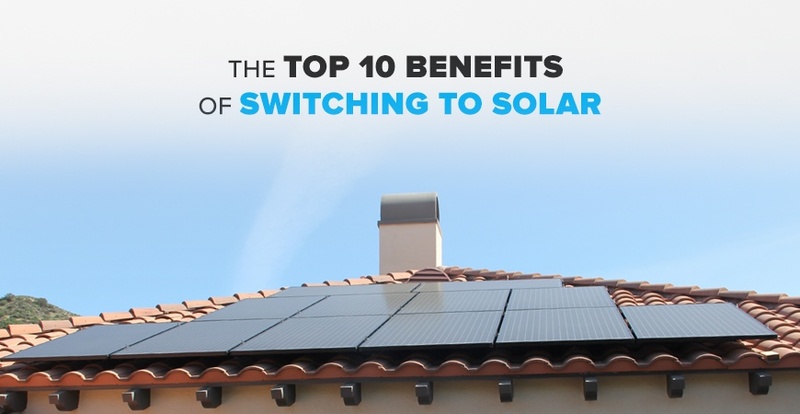 That's why we want to give you top 10 reasons people make the decision to go solar! 1. It’s Exciting to Join The Green Movement. People love the fact that they gain energy independence from their utility. 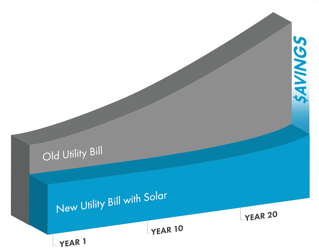 While their neighbors continue to receive rate increases, owners of solar do not. When a utility raises their rates, you just save even more! It’s a great feeling to know you are not contributing to our carbon emission epidemic, but rather, you are using the latest clean energy technology to produce your power. The Federal Government offers a 30% federal solar tax credit for any residential solar panel system installed. This program has been extended until December 31, 2020. If you pay taxes, you qualify for this program, and your net cost for solar is 30% less. If you lease, the leasing company receives this credit and often uses it to reduce your monthly lease payment. Either way, you benefit. The average cost for solar from all installers in California in 2010 was just under $10.00 per watt. By the end of 2013, the average cost per watt was $5.05, and today you will find the cost at $3.85 per watt very common. It is cheaper to go solar today than it has ever been. After solar is installed and turned on, any power you generate that you do not use in your home or business flows into the grid, and you receive a credit from your utility for that power. This is called net metering. Without solar, if you are on vacation, your electric bill would be lower because you were not home using things requiring power. With solar, even when you are on vacation, you generate power and build credits. You never lose the value of the power your solar system generates. 5. Little or No Solar Panel Maintenance. Repairs are covered by manufacturer’s warranties. Maintenance is minimal; consisting of keeping the panels free of dirt and debris. This is done by rinsing the panels with water as needed, usually about two times a year. 6. Solar Will Not Increase Your Property Taxes. In July 2014, California Governor Brown signed SB 871 which extends the existing solar property tax exclusion until January 1, 2025. In California, the continuation of this policy will allow homeowners to install solar energy without a reassessment of their property taxes. 7. Solar Adds Value to Your Home. Research by the U.S Department of Energy’s (DOE) Lawrence Berkeley National Laboratory finds strong evidence that homes with solar photovoltaic (PV) systems sell for a premium over homes without solar systems. When selling your home, the value of your home increases by the cost of your solar system. 8. Lower Your Carbon Emissions. Over the next 25 years, an average home system will save the equivalent of 120 tons of greenhouse emissions, driving a car 218,182 miles less, and absorbing CO2 by planting 4,800 trees. Manufacturer’s warranties are a standard 25 years for production levels and ten years on workmanship. Efficiency for both panels and inverters are also improving. Five years ago, a common panel was rated at 185 watts of DC power. There are panels rated at 400 watts today although more common is in the 250 – 300-watt range. More power from the same space is possible because of quality improvements. Our need for electricity is not diminishing. The cost of traditional fossil fuel generation of power and the maintenance of the grid is always increasing. Where I live, the largest utility in the area has increased their rates by 50% – 88% over the last ten years (! ), depending on the tier rate from which you are buying power. Power from the sun is not costly; it is abundant and other than the initial investment for equipment, it is essentially free. Take a pencil and total how much you spent last year on electricity. Now, multiply that amount over 25 years. John Rocha is the Digital Marketing Director at Sunlux Energy and enjoys learning and educating people about the solar energy technology. He was born and raised out of Edmonton, Canada and got his degree in Marketing from Edmonton University. He also has a black belt in Tae Kwon Do and runs a nonprofit organization.